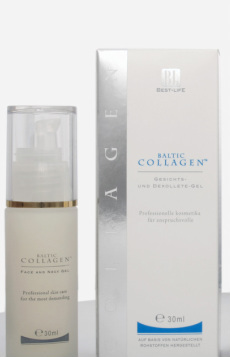 Which is Better: Baltic Collagen Cream or Gel? _In most cases, the product best suited to one's needs is the face gel with the possibility of following up with the cream two times per week. One's own moisturizer can also be used as long as it does not contain alpha or beta hydroxy acids, or alcohols. What explains this? The choice of product depends on (1) age (2) environmental conditions (3) time of year and (4) skin type. Skin undergoes many changes when one reaches their 50's. One such change is the the extent of dryness. Mainly caused by the number of oxidation reactions occurring throughout the body over the years, the body dries out. Skin, too, becomes drier. 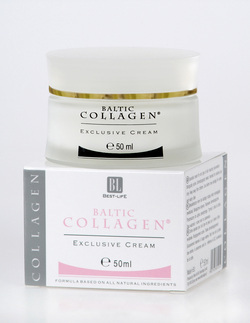 As such the cream is more highly recommended for those with exceptionally dry skin and for those in their fifties. Some climates are more inherently dry than others. Living in a state of humidity is a much different from living in a state of high humidity (mainly in the South of the United States). The reason why your skin becomes dry in the winter time is because of decreased vapor pressures. A cold environment causes skin to evaporate its moisture more easily, like a vacuum. Cold favors exothermicity, however, because the surrounding vapor pressure is so low, body heat is sufficient for evaporation (an endothermic process) to take place. Some skin types are inherently drier than others. freezing temperatures on an outdoor clothesline. along the way. The same loss happens to skin cells and hence, the subsequent proteins they produce. parallel this product, and we stand behind it with our money back guarantee.